Can you believe 4th of July is just around the corner? Since I’m flying to California on the 7th for my 30th, I’m not leaving town for the 4th this year, but my friends and I are whipping up some plans to spend it somewhere fun here in Dallas. Whatever your plans, it’s always fun to throw some patriotic pieces into the mix for the long weekend. 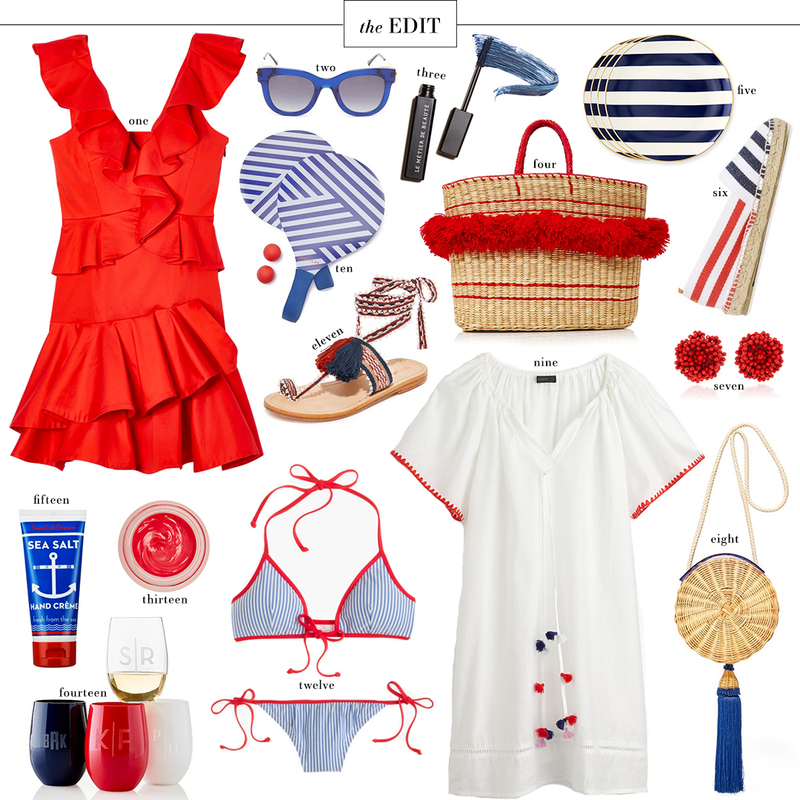 Whether it’s a cute new tote to store your towel, magazines and sunblock, or some personalized acrylic wine glasses you can bring with you anywhere, here’s a great roundup of everything red, white and blue you should be buying this summer. As always, you’ll find even more amazing picks below! I’ve found Trina Turk’s one-pieces to be the most flattering out there, and this one in blue looks like a match made in heaven for the 4th. These “firework” earrings are aptly named, and under $100! They’ll add the perfect punch of red to any outfit. This colorblock dress has been on my list for months, but I have yet to pull the trigger. Maybe now’s the time? If you’ve got a wedding that weekend, try this cobalt blue number. This tiered maxi is a great casual day-to-night option for the 4th! Pair it with white earrings for a crisp, clean look. If you prefer red over blue, this printed maxi is breezy and feminine. This navy straw clutch is too cute and under $40! If you love stripes, check out this swing dress that comes in either navy + white or red + white! Make a splash at the pool in this strappy bright red bikini. I can’t believe the 4th is coming up. Didn’t summer just start?! Anyways, these are cute 4th of july picks!